Photo by Bryan Stevens Newly-arrived migrant birds such as Indigo Bunting were well represented on the 73rd annual Elizabethton Spring Bird Count. The 73rd consecutive Elizabethton Spring Bird Count, which was held Saturday, April 30, set numerous records for this long-running survey of the region’s birds. The 59 observers in 13 parties (both representing record highs for participation) enjoyed favorable weather over the coverage area, which included Carter County and parts of adjacent Johnson, Sullivan, Unicoi and Washington Counties. Photo Courtesy of Jean Potter A total of 166 species of birds, including Rose-breasted Grosbeak, pictured, helped participants in the Elizabethton Spring Bird Count, establish a new record high for this annual survey. The old record of 161 species was set back in 2005. Long-time count compiler Rick Knight announced that the annual count tallied 166 species, eclipsing the previous record of 161 set in 2005. By comparison, the average number over the last 30 years has been 147 species. Highlights for this year’s Spring Bird Count included American Golden-Plover and Fish Crow, which were new to this annual survey of birds in the region. 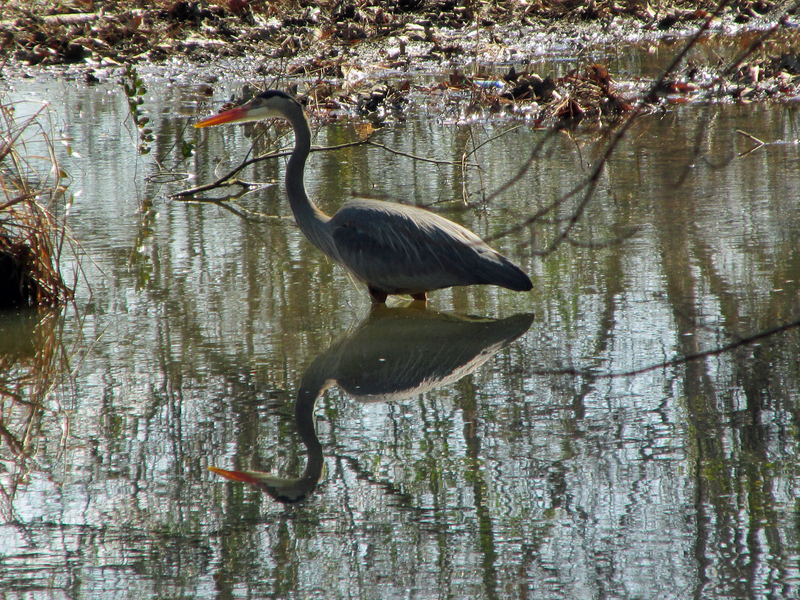 Photo by Bryan Stevens The presence of several nesting colonies of Great Blue Herons could help explain a new record-high for this species on this year’s count. Other notable find included Hooded Merganser (a hen with two young), a lingering pair of Common Mergansers, Virginia Rail, Black-billed Cuckoo, Northern Saw-whet Owl, Peregrine Falcon, Sedge Wren and Cerulean Warbler. Amazingly, given the long history of this count, 21 species occurred in record high numbers this year. Knight said the increased number of observers and parties certainly contributed to this. Photo Courtesy of Jean Potter Although the Sora is rarely found during this annual count, the four individuals found this year represented an all-time high for the species on this yearly survey. The record highs were for the following species: Canada Goose (653), Mallard (332), Wild Turkey (57), Great Blue Heron (107), Yellow-crowned Night-Heron (14), Black Vulture (152), Spotted Sandpiper (83), Barred Owl (12), Belted Kingfisher (30), Red-bellied Woodpecker (97), Warbling Vireo (20), Red-eyed Vireo (257), Ovenbird (244), Worm-eating Warbler (39), Yellow-throated Warbler (44), Eastern Towhee (222), Scarlet Tanager (82), and Baltimore Oriole (38). Three species — Orchard Oriole (42), Northern Saw-whet Owl (3) and Sora (4) — tied previous high counts. Photo by Bryan Stevens Common backyard birds, such as Northern Cardinal, were among the record-high 166 species found. Canada Goose, 653; Wood Duck, 85; American Wigeon, 2; Mallard, 332; Blue-winged Teal, 6; Bufflehead, 5; Hooded Merganser, 3; and Common Merganser, 2. Northern Bobwhite, 1; Ruffed Grouse, 1; Wild Turkey, 57; Common Loon, 1; Pied-billed Grebe, 5; Horned Grebe, 1; and Double-crested Cormorant, 65. Great Blue Heron, 107; Green Heron, 16; Black-crowned Night-heron, 1; Yellow-crowned Night-Heron, 14; Black Vulture, 152; and Turkey Vulture, 212. Osprey, 15; Bald Eagle, 10; Sharp-shinned Hawk, 2; Cooper’s Hawk, 7; Broad-winged Hawk, 16; and Red-tailed Hawk, 38. 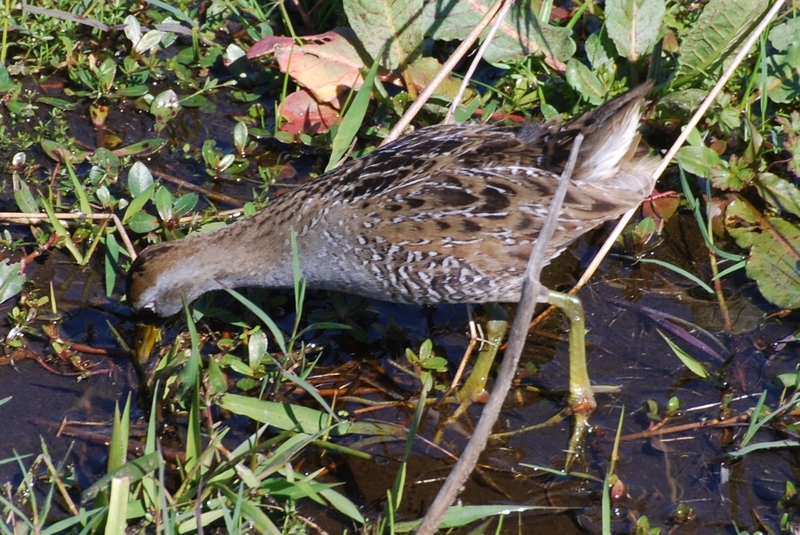 Virginia Rail, 1; Sora , 4; American Coot, 3; American Golden-Plover, 1; Killdeer, 46; Spotted Sandpiper, 83; Solitary Sandpiper, 34; Greater Yellowlegs, 2; Lesser Yellowlegs , 2; Least Sandpiper, 5; and Pectoral Sandpiper, 2. 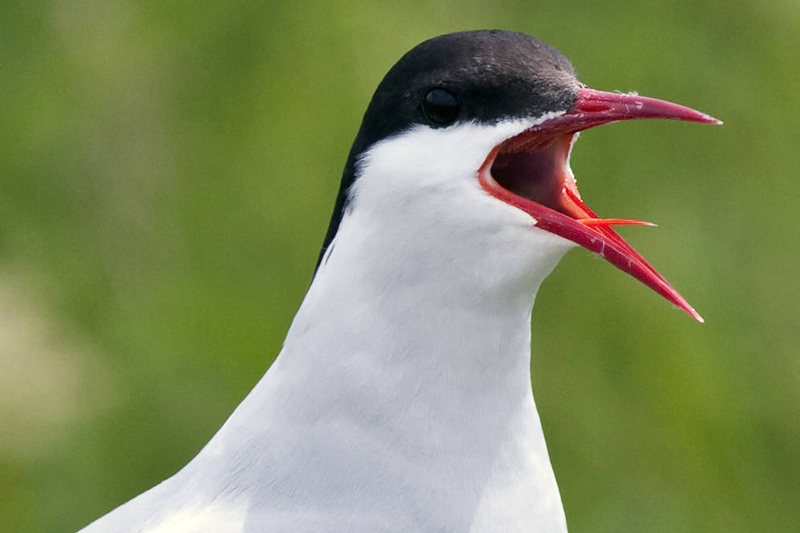 Bonaparte’s Gull, 1; Ring-billed Gull, 7; Forster’s Tern, 7; Rock Pigeon, 166; Eurasian Collared-Dove, 3; Mourning Dove, 254; Yellow-billed Cuckoo, 9; and Black-billed Cuckoo, 1. Eastern Screech-Owl, 10; Great Horned Owl, 6; Barred Owl, 12; Northern Saw-whet Owl, 3; Common Nighthawk, 1; Chuck-will’s-widow, 10; Eastern Whip-poor-will, 32; Chimney Swift , 209; Ruby-throated Hummingbird, 31; and Belted Kingfisher, 30. Red-headed Woodpecker, 2; Red-bellied Woodpecker, 97; Yellow-bellied Sapsucker, 4; Downy Woodpecker, 37; Hairy Woodpecker, 10; Northern Flicker, 33; Pileated Woodpecker, 43; American Kestrel, 19; and Peregrine Falcon, 1. Eastern Wood-Pewee, 7; Acadian Flycatcher, 12; Least Flycatcher, 6; Eastern Phoebe, 77; Great Crested Flycatcher, 15; and Eastern Kingbird, 57. Loggerhead Shrike, 1; White-eyed Vireo, 12; Yellow-throated Vireo, 9; Blue-headed Vireo, 78; Warbling Vireo, 20; Red-eyed Vireo, 257; Blue Jay, 320; American Crow, 338; Fish Crow, 1; Common Raven, and 14; Horned Lark, 2. Purple Martin, 81; Tree Swallow, 426; Northern Rough-winged Swallow, 133; Barn Swallow, 217; and Cliff Swallow, 807. Carolina Chickadee, 173; Tufted Titmouse, 166; Red-breasted Nuthatch, 16; White-breasted Nuthatch, 26; and Brown Creeper, 4. House Wren, 45; Winter Wren, 4; Sedge Wren, 1; Carolina Wren, 129; Blue-gray Gnatcatcher, 97; Golden-crowned Kinglet, 5; and Ruby-crowned Kinglet, 4. Photo Courtesy of Jean Potter Vireos, such as this Red-eyed Vireo on a nest, were quite abundant. The numbers of Red-eyed Vireos and Warbling Vireos set all-time highs for the count. Eastern Bluebird, 157; Veery, 13; Swainson’s Thrush, 2; Wood Thrush, 138; American Robin, 888; Gray Catbird, 55; Brown Thrasher, 45; Northern Mockingbird, 122; European Starling, 986; and Cedar Waxwing, 44. Ovenbird, 244; Worm-eating Warbler, 39; Louisiana Waterthrush, 32; Golden-winged Warbler, 2; Black-and-white Warbler, 90; Swainson’s Warbler, 6; Nashville Warbler, 1; Kentucky Warbler, 5; Common Yellowthroat, 27; Hooded Warbler, 208; American Redstart, 21; Cape May Warbler, 4; Cerulean Warbler, 2; Northern Parula, 56; Magnolia Warbler, 3; Bay-breasted Warbler, 2; Blackburnian Warbler, 7; Yellow Warbler, 15; Chestnut-sided Warbler, 36; Blackpoll Warbler, 1; Black-throated Blue Warbler, 85; Palm Warbler, 8; Pine Warbler, 10; Yellow-rumped Warbler, 62; Yellow-throated Warbler, 44; Prairie Warbler, 5; Black-throated Green Warbler, 81; Canada Warbler, 44; and Yellow-breasted Chat, 8. Eastern Towhee, 222; Chipping Sparrow, 126; Field Sparrow, 72; Savannah Sparrow, 1; Grasshopper Sparrow, 4; Song Sparrow, 276; Swamp Sparrow, 5; White-throated Sparrow, 13; White-crowned Sparrow, 11; and Dark-eyed Junco, 63. Photo by Bryan Stevens While some species set record highs, only 10 Hairy Woodpeckers, like this male, were found by participants in the annual Elizabethton Spring Bird Count. 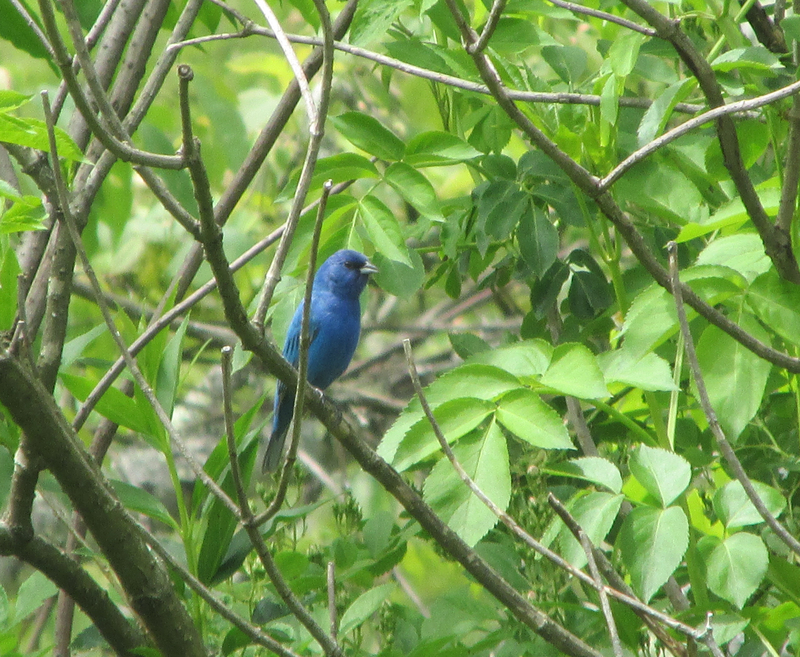 Summer Tanager, 1; Scarlet Tanager, 82; Northern Cardinal, 299; Rose-breasted Grosbeak, 30; Blue Grosbeak, 6; and Indigo Bunting, 126. Bobolink, 1; Red-winged Blackbird, 480; Eastern Meadowlark, 142; Rusty Blackbird, 2; Common Grackle, 477; Brown-headed Cowbird, 91; Orchard Oriole, 42; and Baltimore Oriole, 38. House Finch, 56; Pine Siskin, 59; American Goldfinch, 354; and House Sparrow, 80. This entry was posted in Bryan Stevens Feathered Friends, Carter County Compass, Common Birds of Northeast Tennessee, Elizabethton Star, Erwin Record, Hairy Woodpecker, Our Fine Feathered Friends, Rose-breasted Grosbeak, Spring Bird Count, Spring birds, Spring migration, Vireos and tagged Birding, birds, Bristol Herald Courier, Bryan Stevens, Carter County Compass, Elizabethton Star, Erwin Record, Feathered Friends, McDowell News, Northeast Tennessee, Our Fine Feathered Friends, Songbirds, Spring Bird Count, Spring migration, The Erwin Record, warblers on May 21, 2016 by Bryan Stevens. 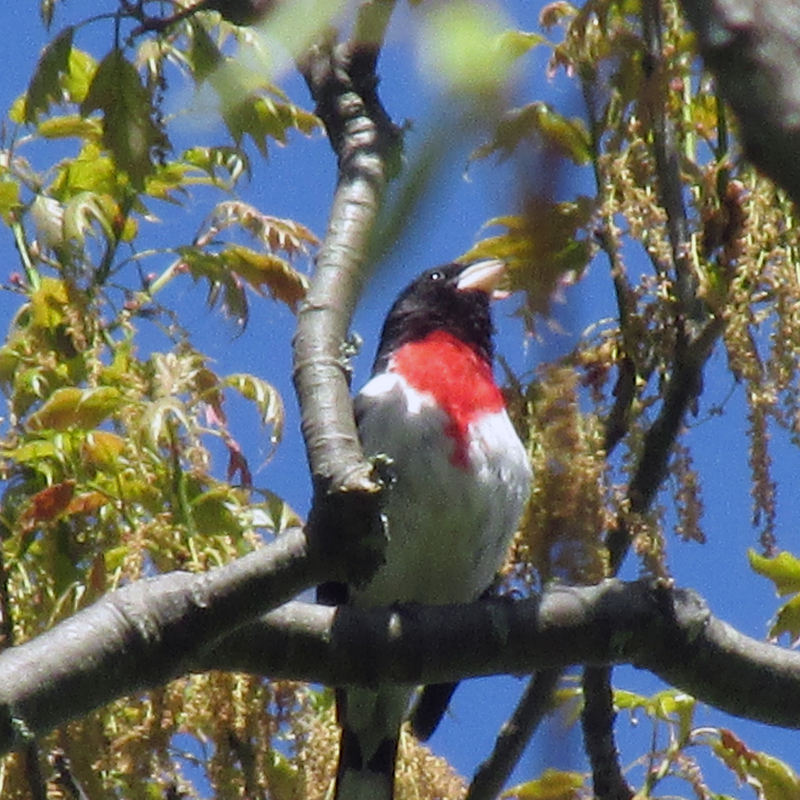 The spring arrival of Rose-breasted Grosbeaks is a temporary visit. 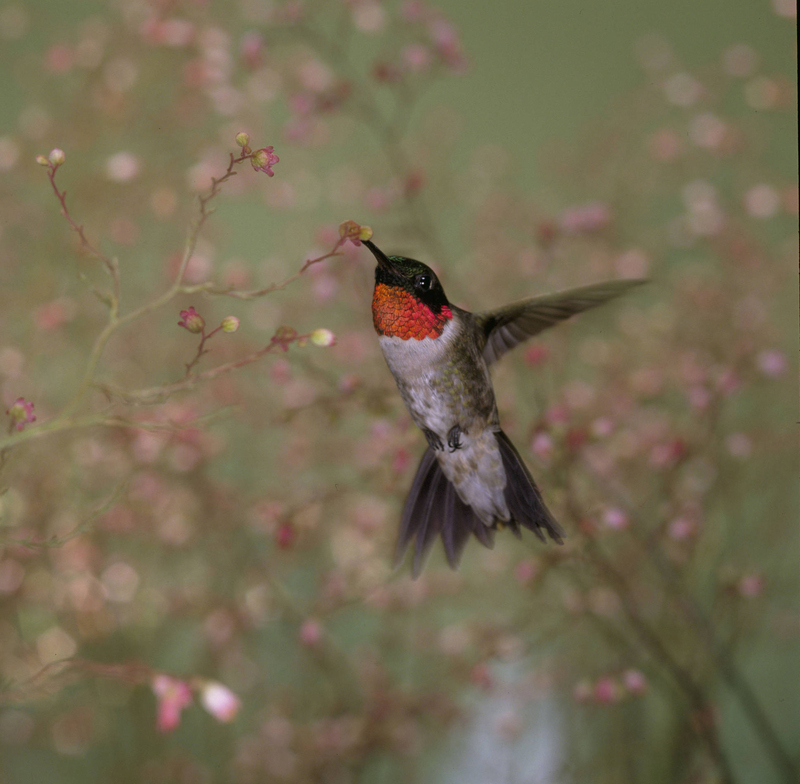 Finding the arrangements, which can consist of well-stocked feeders and perhaps a convenient water source, the migrating birds may linger for several days. 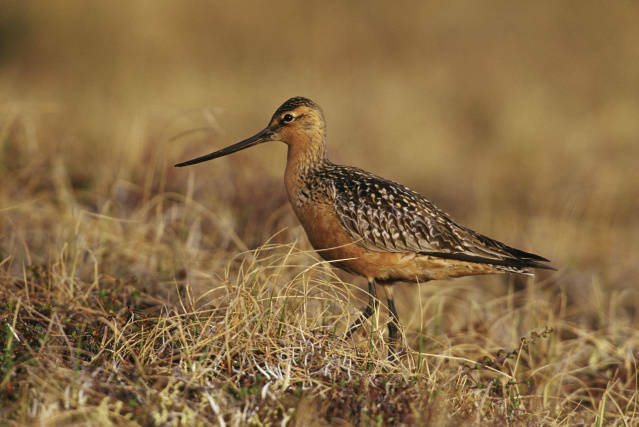 These birds nest at higher elevations, however, and are usually impatient to continue the journey to where they will spend the summer months tending to their young. This year, my first Rose-breasted Grosbeak arrived at my home on Simerly Creek Road in Hampton around 3:30 p.m. on Friday, April 25. I saw a glimpse of black and white with a hint of red that lifted my spirits instantly. 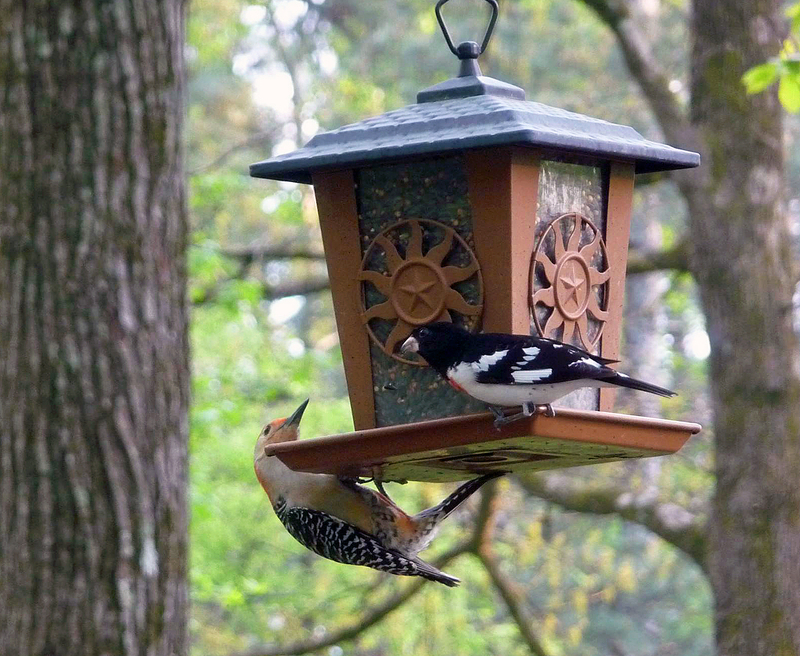 I had been hoping for about a week that migrating grosbeaks would visit as they often do in the spring. 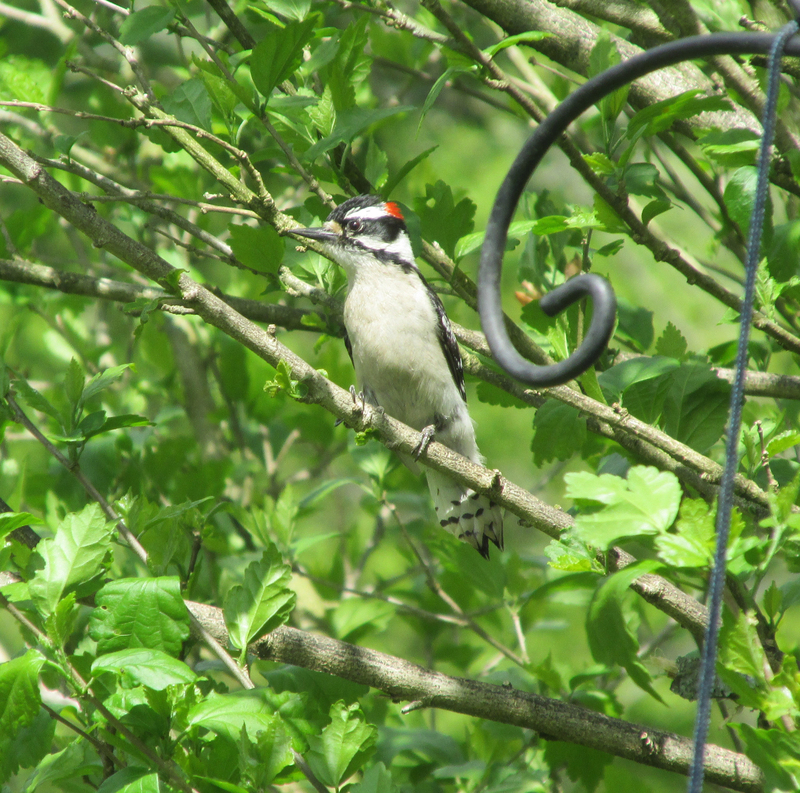 The lone male settled onto a small hanging feeder and began enjoying an offering of black-oil sunflower seeds. He made repeated trips throughout the afternoon and evening, allowing me to take several photos through a window. Some of my posted photos drew enthusiastic comments from my Facebook friends. 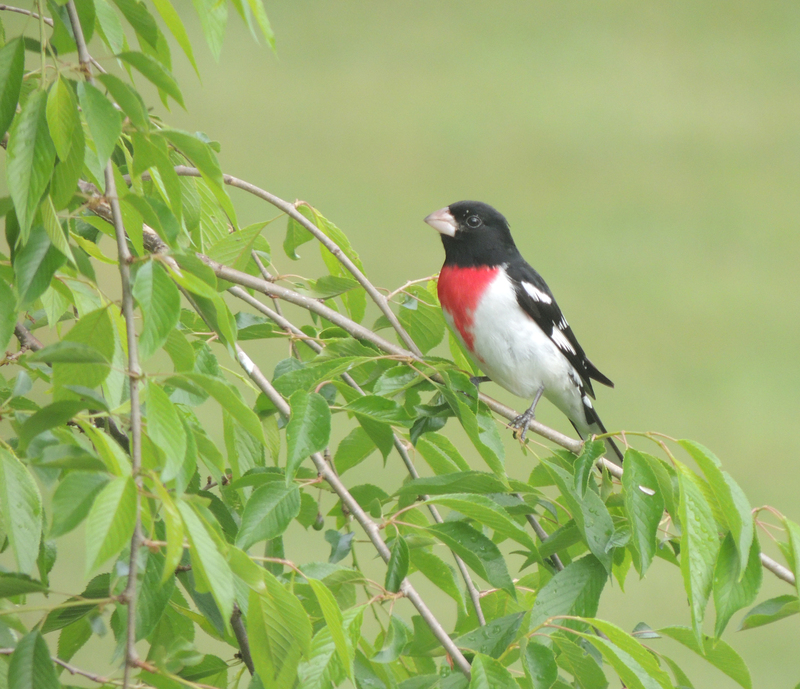 Dani Sue Thompson shared that the beautiful Rose-breasted Grosbeak is one of her favorite birds. 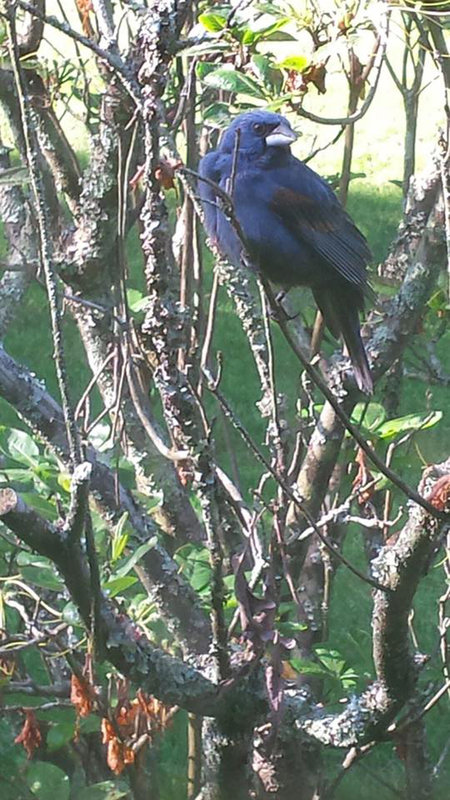 Her mother, the late Donna Adams, was a huge fan of the related Blue Grosbeak, which is a less common visitor to Northeast Tennessee than the related Rose-breasted Grosbeak. Donna and I share many a grosbeak story over the years. Byron Tucker, a friend from Atlanta, notified me on Facebook the day before the Rose-breasted Grosbeak arrived at my home that he was hosting them in Georgia. From a single bird to a flock of three males and three females, these visitors were a first for Byron. 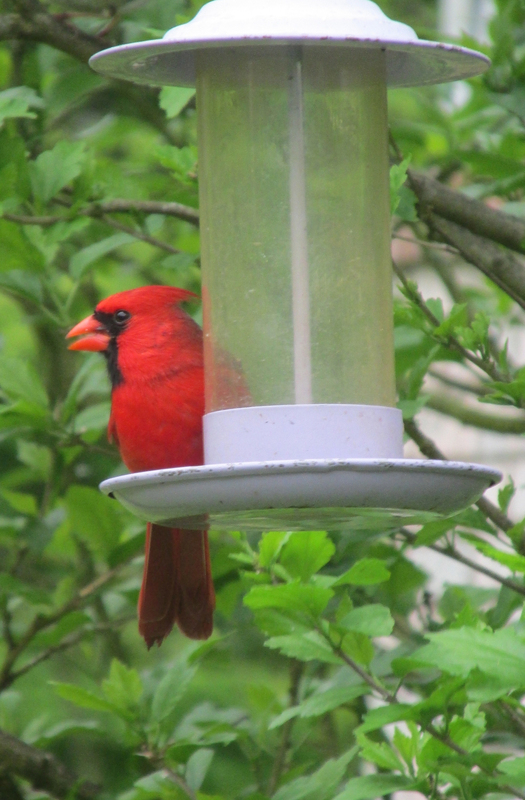 He was excited to host these colorful birds for several days at his feeders. 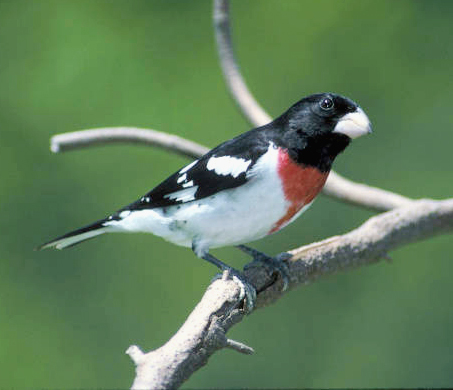 As fall approaches, the Rose-breasted Grosbeak migrates south to a winter range that spans central Mexico, Central America and northern South America. As they depart, many of these migrating birds will make autumn visits to again partake of offerings of sunflower seeds at backyard feeders. So, if you don’t get to see these showy birds in the spring, you get another chance in September and October. 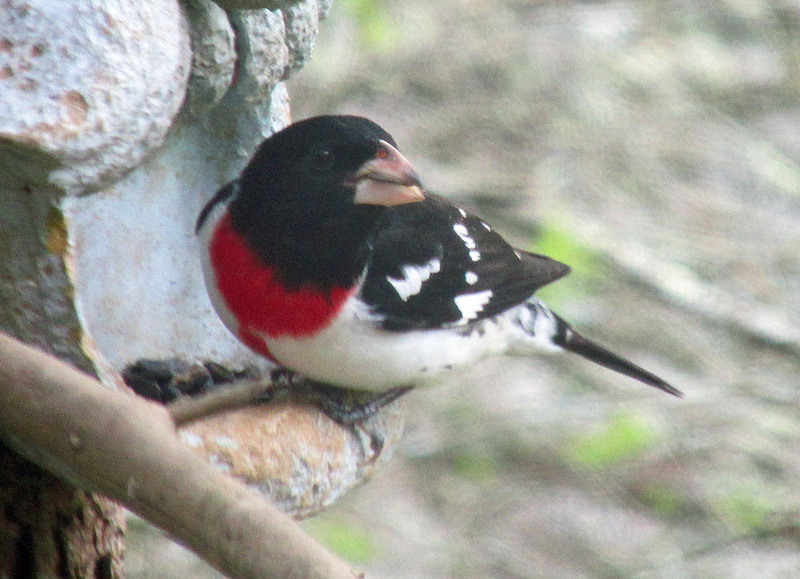 The male Rose-breasted Grosbeak gives this species it name. 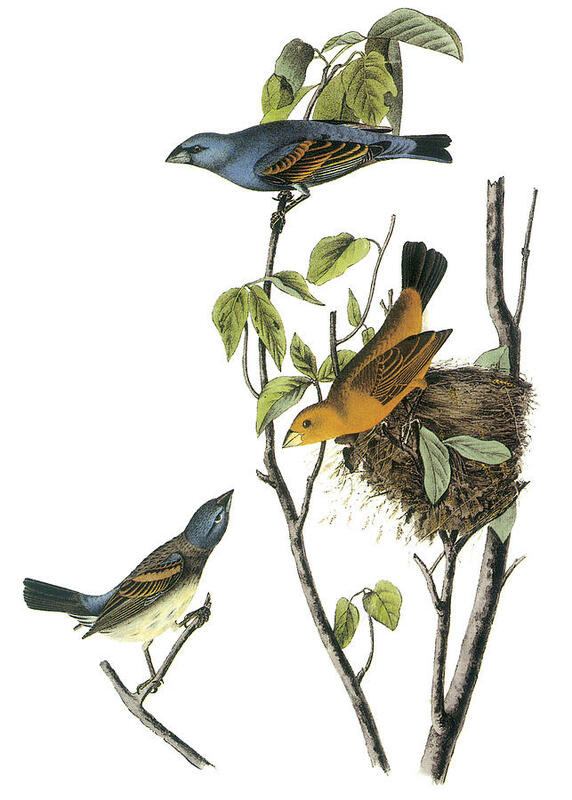 Males are the epitome of the birds that make their home for part of the year in the American tropics. The contrasting black and white plumage is emphasized by a triangular slash of rosy-red color on the breast. Put all those elements together and the male Rose-breasted Grosbeak is not a bird that would be mistaken for any other. 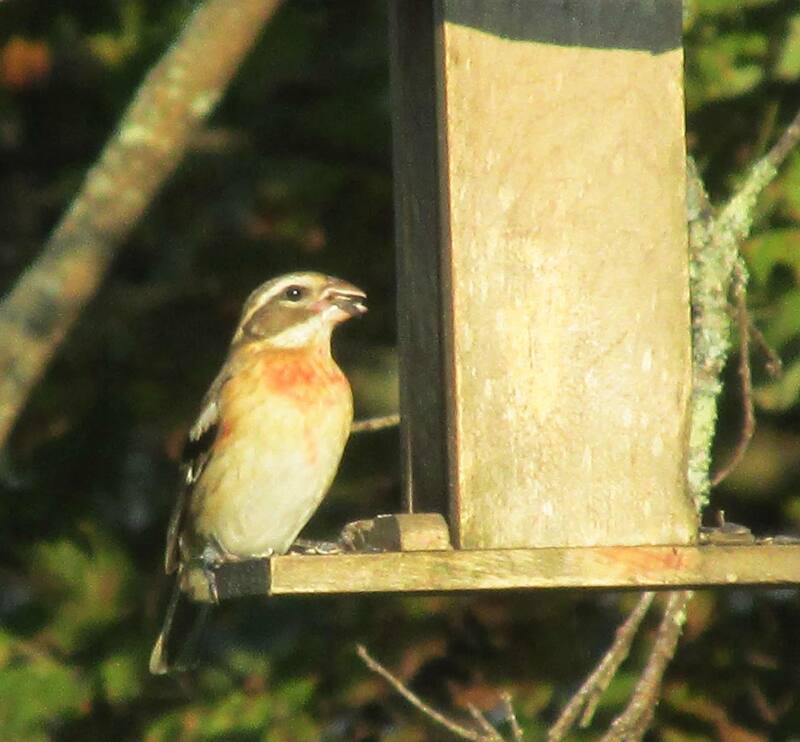 The female grosbeak, however, doesn’t quite stand out in the same way. She is much less colorful than the male. 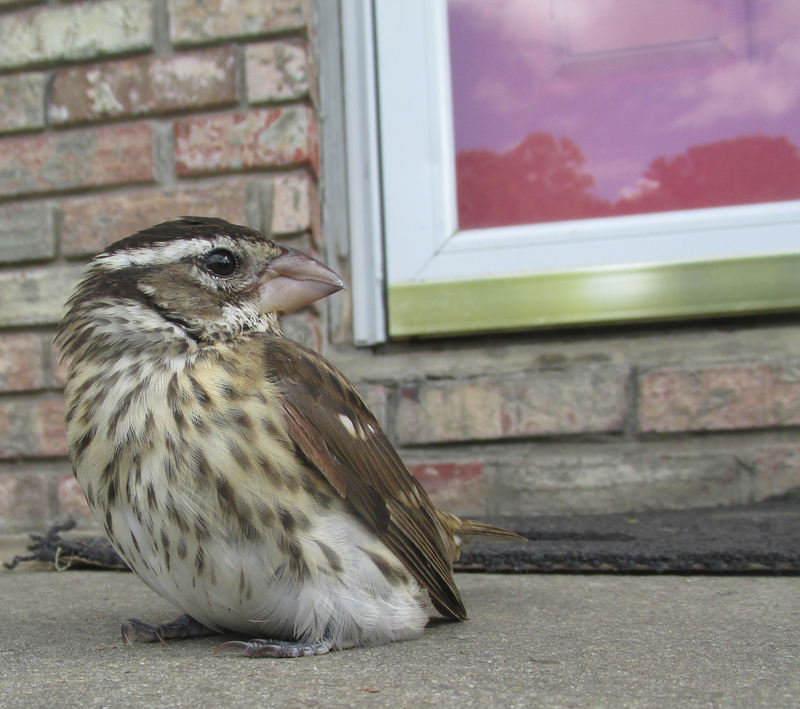 With her brown and white plumage, she is often mistaken for a large sparrow or finch. 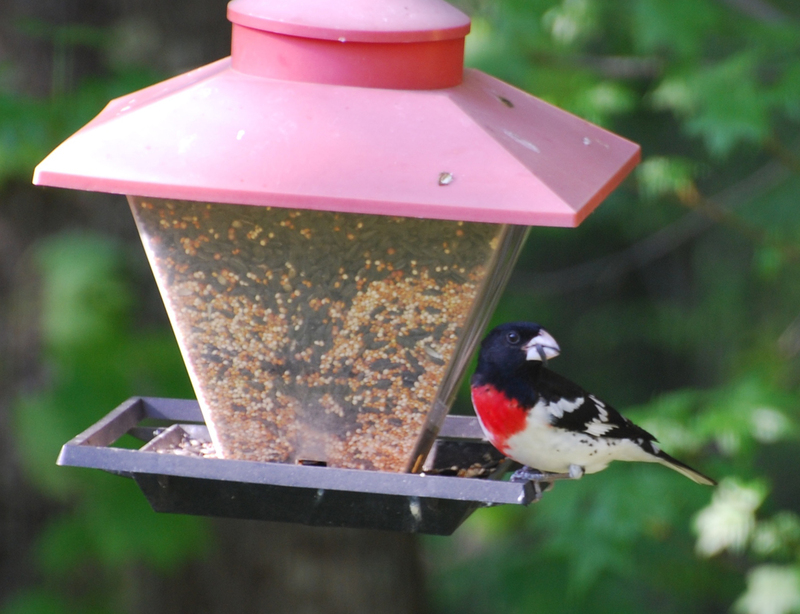 A young male Rose-breasted Grosbeak visits a feeder in September of 2013. Young males resemble females but show a splash of orange on the breast that will be replaced the following spring by the familiar rosy-red patch. With some birds, males play only a minor role in the nesting process. That’s not the case with the Rose-breasted Grosbeak male. The males help with nest-building chores and share responsibility with the female for incubating the eggs. The female lays three to five eggs in a cup-shaped nest. 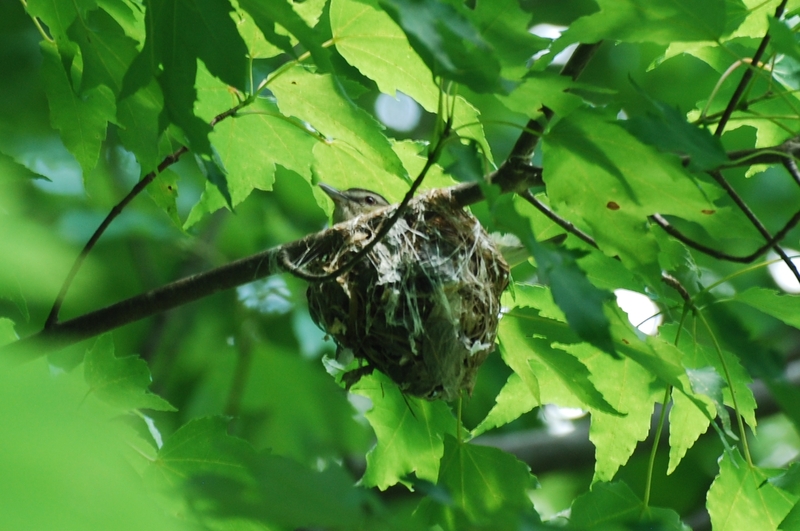 It’s not easy to locate the nests since the birds usually place them in trees at least 20 feet above the ground. Within two weeks, the eggs have hatched and the parents are kept extremely busy finding enough food to satisfy the voracious nestlings. Well fed by both parents, the young grow quickly and usually are ready to leave the nest within 12 days. Often, when a first brood of young departs the nest, the male will care for the rowdy group of fledglings as the female starts a second nest to capitalize on the long days of summer. 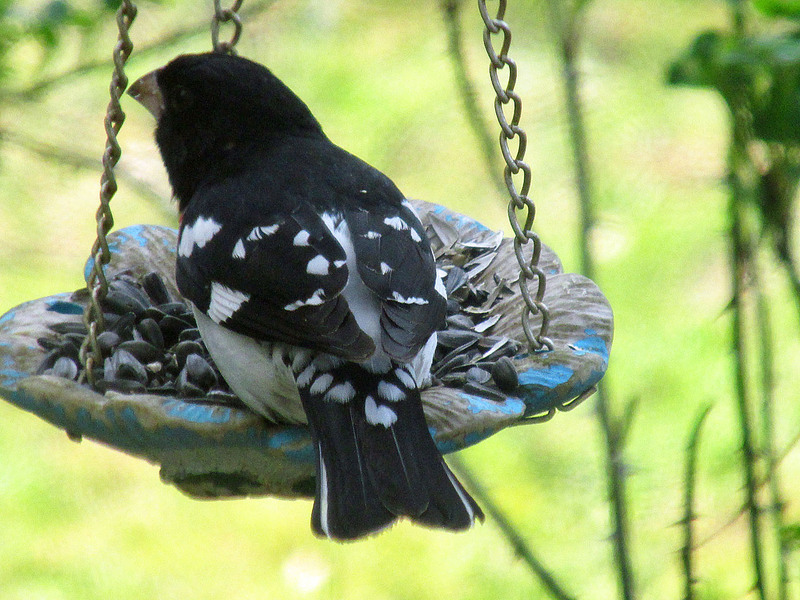 Away from our feeders, Rose-breasted Grosbeaks feed on insects, seeds, fruit and even some leaf buds and flowers. I’ve seen these birds satisfying a sweet tooth — or should that be sweet beak? — by feeding on jewelweed flowers and apple blossoms. If sugar’s good for hummingbirds, I am sure it is a valuable energy source for Rose-breasted Grosbeaks, too. The Rose-breasted Grosbeak is a cherished spring visitor that never fails to disappoint by bringing a hint of the tropics to the mountains of Northeast Tennessee. I’m hoping many readers are also enjoying their own opportunities for hosting this delightful songbird. The bird walk at Tipton-Haynes Historic Site on Saturday, April 26, yielded a good range of birds, including American Robin, House Wren, Cardinal, Song Sparrow, Carolina Chickadee, American Goldfinch, Tufted Titmouse, Crow, Canada Goose, Chimney Swift, Brown Thrasher, Barn Swallow, Eastern Towhee, European Starling, Yellow-rumped Warbler, Chipping Sparrow, Mallard, Red-winged Blackbird, Red-bellied Woodpecker, Turkey Vulture, Black Vulture, Northern Flicker, Grackle, Gray Catbird, Blue Jay, Mourning Dove and Eastern Bluebird. 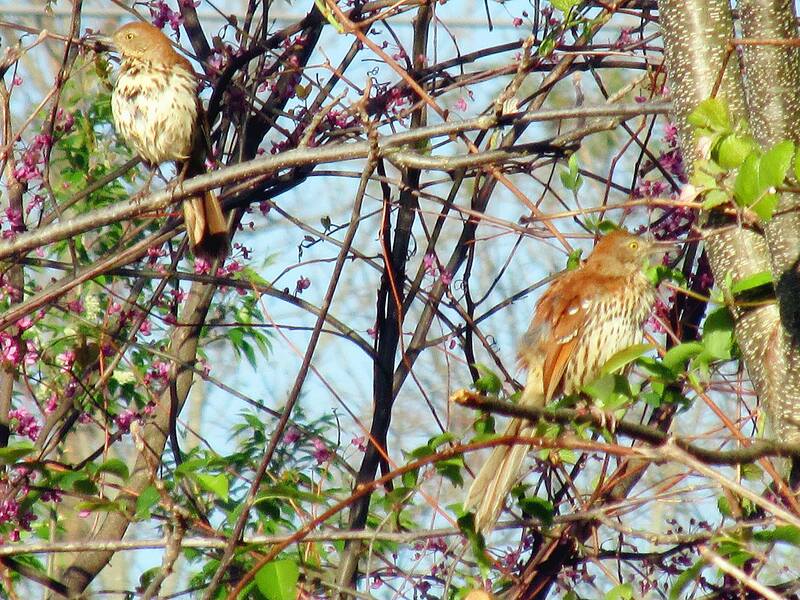 A pair of Brown Thrashers provided quite a show for attendees at a recent bird walk at Tipton-Haynes Historic Site. Attending the walk were Heather Jones, Charles Moore, David Thometz and myself. We enjoyed perfect spring weather and also admired the many wildflowers in the gardens and woodlands at the Johnson City historic site. Members of the Lee and Lois Herndon Chapter of the Tennessee Ornithological Society will also hold a bird walk at 8 a.m. on Saturday, May 10, at Sycamore Shoals State Historic Park in Elizabethton. This walk is held in honor of International Migratory Bird Day and should provide participants with an excellent opportunity for seeing some fine birds. I enjoy hearing from readers. Share a sighting, ask a question or make a comment by emailing me at ahoodedwarbler@aol.com or posting to my Facebook page. The Rose-breasted Grosbeak never fails to impress. This entry was posted in Birding, Birds, Carter County Compass, Elizabethton Star, Erwin Record, Rose-breasted Grosbeak and tagged Birding, Carter County Compass, Elizabethton Star, Erwin Record, Grosbeaks, Rose-breasted Grosbeaks, Spring migration, Sycamore Shoals State Historic Park, Tipton-Haynes Historic Site on May 4, 2014 by Bryan Stevens.